Testing out new waters in their latest EP, London native John Purcell from Azoora, has teamed up with the sweet voiced Montreal siren, Graciellita, for this new compilation. Apart, is the 7th EP released under the band’s name. 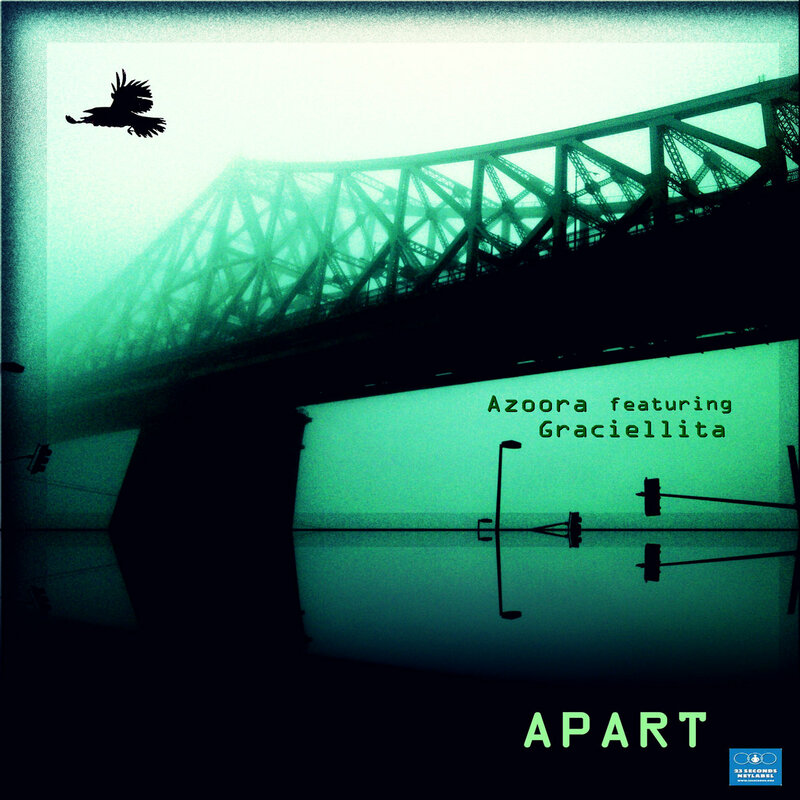 The record incorporates the resident electronic, trip hop sound of Azoora with the angelic voiced singer’s lovely and fresh vocals. There’s an atmosphere of softness as well as one of brooding intensity present in this 5-track compilation. With beautiful piano accompaniments, lush loops and catchy beats floating in the cuts; the record is an easy candidate for your favorites list. Azoora is one of those acts that’ll change your mind about trip hop and electronica even if you aren’t particularly fond of the genre. Their sound is reminiscent of the heydays of Brit dub and triphop during the middle to late 90s. With their latest album, this intriguing sound is still quite prominent and more likable then ever. Accompanied by the fresh vocals of Graciellita, songs like, Motionless, gain a whole other dimension. The song features lush instrument work, with sounds emanating from all four corners. Thanks to Graciellita’s vocals seamlessly flowing in between the rich textures, the cut becomes an instant favorite and perfectly opens up the compilation. Second track, Episodes, is more moody. Azoora’s sound is a bit more darker on this one but it still manages to enchant listeners. The last two tracks, Ugly Weather and Bit By Bit, are also more intense compared to the opener. Ugly Weather starts with a brooding sound then slowly introduces a hypnotic and dark drum beat. Graciellita’s vocals add a whimsical touch to this otherwise meditative single. On the other hand, Bit By Bit, caps off the record with the same moodiness and reflective vibe as the former. Out of all the cuts, this song is one where Graciellita’s voice closely echoes Kelli Dayton from the Sneaker Pimps. Even the entire atmosphere of the song somewhat reminds of the old trip hop crew. Overall, Azoora has created a compilation that both pushes their original sound while still retaining the charisma that attracted their fans in the first place. With the addition of female vocals, their sound sounds richer in a lot of ways. The band and Graciellita are definitely two genuine artists and together they’ve created an awesome trip hop record worth raving about. Pilots in Orbit: Did You Grow Up Too Fast? Great album!! �Never heard of Azoora & Graciellita but they wow’d me the first time I heard this. �Thank you!! its ok. i would have loved this 1 years ago… good but late. sorry i ment 10 years not 1 year.